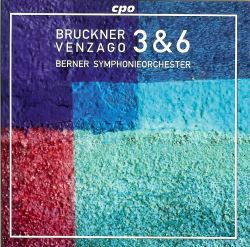 Mario Venzago continues his interesting Bruckner cycle for CPO with a set coupling the Third and Sixth Symphonies. Various orchestras have been involved in this project and this time both performances feature the Berne Symphony Orchestra, who give a thoroughly creditable account of themselves. The discs are nicely presented in a slimline box, and there are full programme notes, albeit in tiny print. In an interview the conductor shares his ideas about Bruckner’s music. In whichever version (1873, 1877 or 1889) Bruckner’s Third is a marvellous symphony, which proclaims the full range and power of his genius. Mario Venzago is an experienced and committed Bruckner conductor, as previous issues in the series have proved. He has also shown great concern for choosing the most appropriate edition of each symphony. This makes it something of a surprise that he has opted for the third (1889) version of the Third, with its shortened finale. The recorded sound brings great clarity and a suitable atmosphere; nowhere more than in the first movement’s opening phase, when Bruckner so skilfully articulates the evolution of the first subject through scoring of the utmost imagination. Each section of the Berne orchestra acquits itself admirably here. In the slow movement there is a good balance between lyrical flow and profound expressiveness, and when the strings are required to glow, they certainly do. The rustic scherzo is also well characterised, with strong rhythms as in a dance of the earth at one extreme, and pastoral innocence at the other. As so often in 19th century symphonies, the finale is the most problematic part of the score. There are those who will contend that only the original 1873 version will do. The 1889 version is more drastically cut than that from 1877, in which the musical structure holds up more strongly. To be fair, Venzago makes a strong case for the shorter span of the 1889 version, with dramatic incident all the more important therefore. He and his players generate suitable energy and even vehemence in the first subject, which overall provides probably the most important aspect of the movement. However, it is the second theme that warrants the most exact description, since it is a subtle combination of polka and chorale which Bruckner described with a telling anecdote: ‘In the tavern there is dancing, while next door the master lies in his coffin.’ The performance articulates these aspects very successfully and this adds considerably to the whole experience. Towards the end of the work the principal theme from the first movement comes back to make its emphatic point. It confirms the essential unity of the conception, which it most certainly does in this fine performance. Bruckner’s Third Symphony is well served on CD in all three versions. Among those who have recorded the 1889 version, Günter Wand and the North German Radio Symphony Orchestra (RCA 09026613742) and Sylvain Cambreling and the SWR Symphony Orchestra (Glor Classics GC10391) are also highly recommendable. However, this new CPO issue is a 2 CD set, and comment on the Third Symphony must therefore be linked with comment on the performance of the Sixth. Alas, this seems to me to be much less successful. This work is often regarded as being difficult to bring off. If that is indeed the case Venzago adds further fuel to that particular flame. Again the recording is good, and so too is the orchestral playing. Unfortunately there is rhythmic unsteadiness in the first movement, which begins quickly but later on starts to drag. The phrasing can misfire too, with some of Bruckner’s most poetic ideas becoming somehow matter-of-fact;, take, for example, the horns’ pp rocking figure which swells so majestically towards the final climax. The Adagio gains from some refined dynamic shadings, while the music moves fluently at a mobile tempo. This can work well in this movement, as Otto Klemperer’s celebrated performance proved (EMI 4 04296 2). Again too much of the phrasing feels wrong, not least in the wonderful third theme in funeral march rhythm. This quite misses the mark here. The Scherzo is altogether more successful, with abundant detail in the texture thanks to the splendid recording. The finale succeeds in generating plenty of drive and energy. Overall, this performance of the Sixth fails to achieve the vision and eloquence of the conductor’s other Bruckner performances. Quite why CPO chose to issue these two symphonies together rather than individually is hard to fathom. There is no obvious musical reason for doing so, other than that the same conductor and orchestra are featured. That is hardly sufficient reason, and even without the mismatch between the relative merits of the two performances the logic seems flawed.